Amal Clooney welcomed former Mald­ives president Mohamed Nasheed at Heathrow airport, London, after the Indian Ocean islands’ government granted him prison leave for urgent surgery. 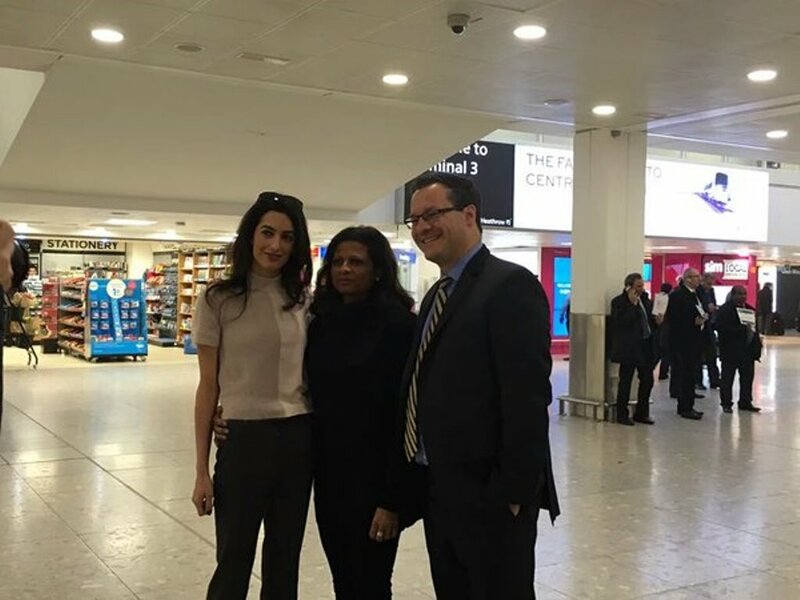 “We have just landed”, said Sabra Noordeen, who was travelling with Nasheed, whose conviction last March on terror-related charges has been widely criticised. 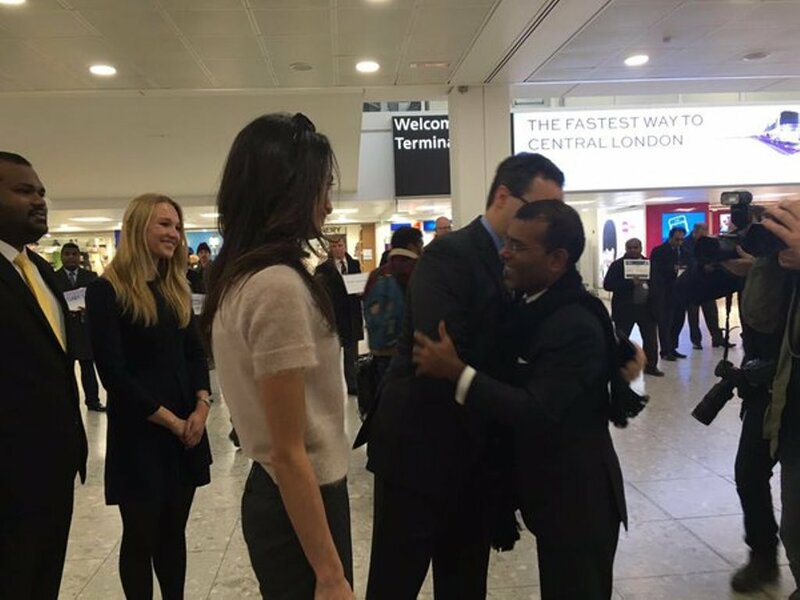 The Maldives government said Nasheed was travelling under what diplomatic sources described as a deal brokered by India, Sri Lanka and Britain. 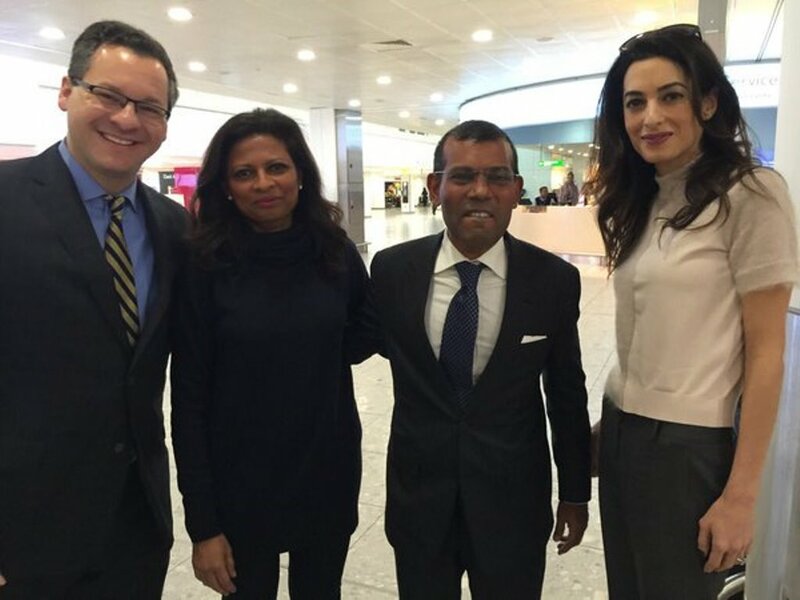 But Nasheed refused a government request to leave a relative behind to act as a guarantor liable to prosecution if he failed to return to serve the rest of his sentence. After a tense back and forth over conditions, the government finally agreed late Monday to let him leave. 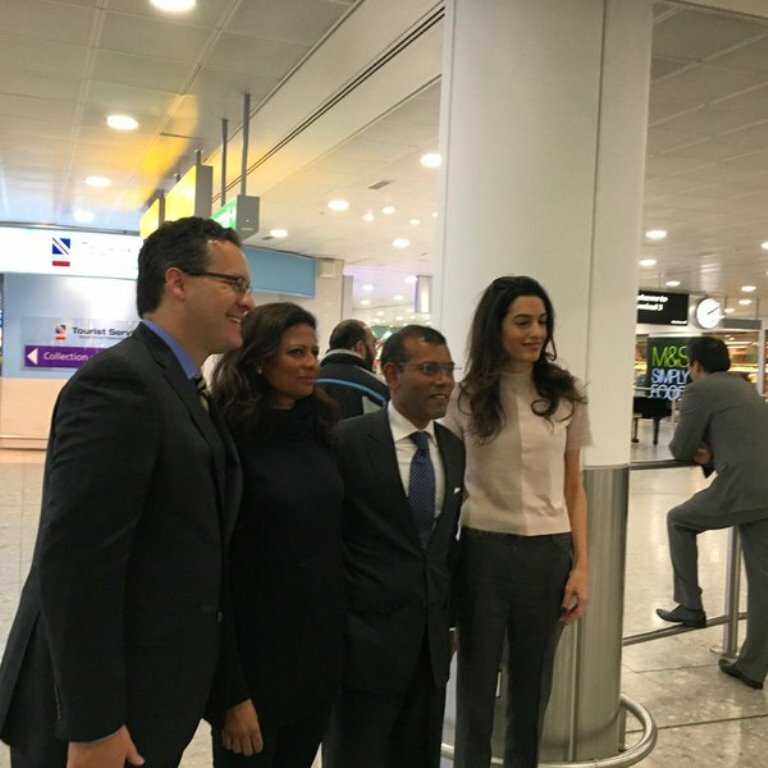 Amal Clooney welcomes him with big smiles and a strong hug. On Monday January 25th 2016 a press conference will be held in London . In this press conference, President Nasheed and his lawyers will assess the political situation in the Maldives and highlight the human rights abuses still ongoing in a country most people associate with tropical paradise. 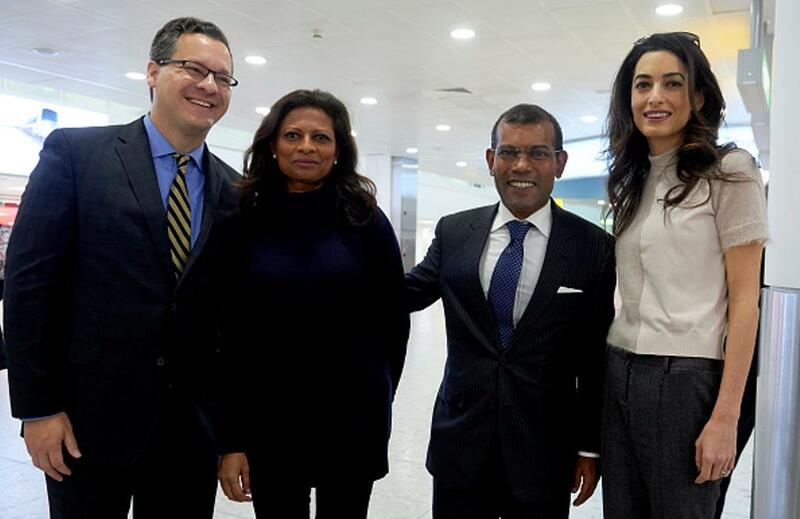 Speakers: President Mohamed Nasheed; Jared Genser of Freedom Now, Amal Clooney of Doughty Street Chambers and Ben Emmerson of Matrix Chambers, counsel to President Nasheed. Close call today at Heathrow. Thanks for the quick save Mrs Clooney! I will update later my post. Thank you ,Nati, for posting those winderful pics. What a pleasure to see them all! To get Nasheed out of jail is an important step. 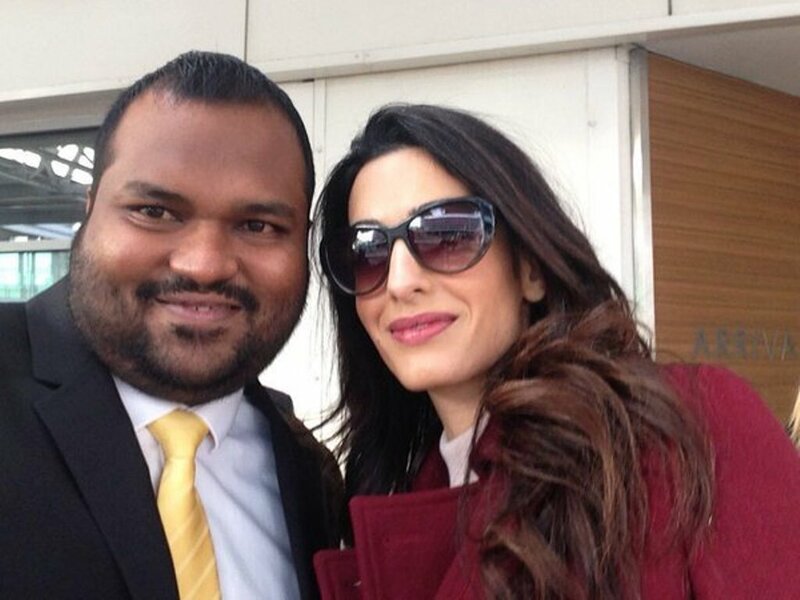 How nice: Amal warned the person filming them “be careful …” She took care … great and very nice. Nati, are you sure, the bag is made from reptile? Bonjour, félicitations pour votre blog ! 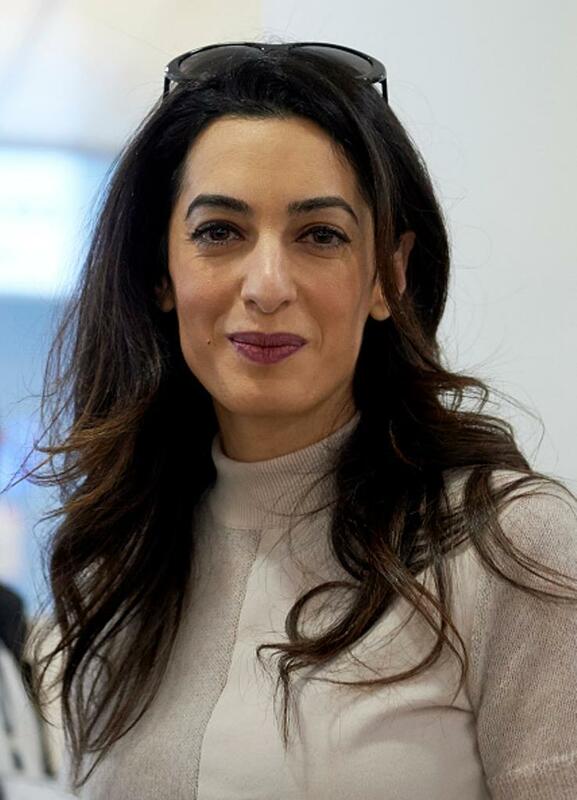 Je ne connais pas Amal Clooney et je suppose que c’ est une aimable personne mais sa maigreur est inquiétante et virilise son visage. Je trouverais dangereux et navrant qu’ elle soit prise comme un exemple par des jeunes femmes qui confondraient anorexie et renommée. Elle a toujours été très mince. C’est une femme accomplie et courageuse et je pense que ce sont ces qualités qu’elles vont retenir. C’ est bien qu’ une femme soit ainsi une référence pour ses accomplissements mais aussi son goût du fun. 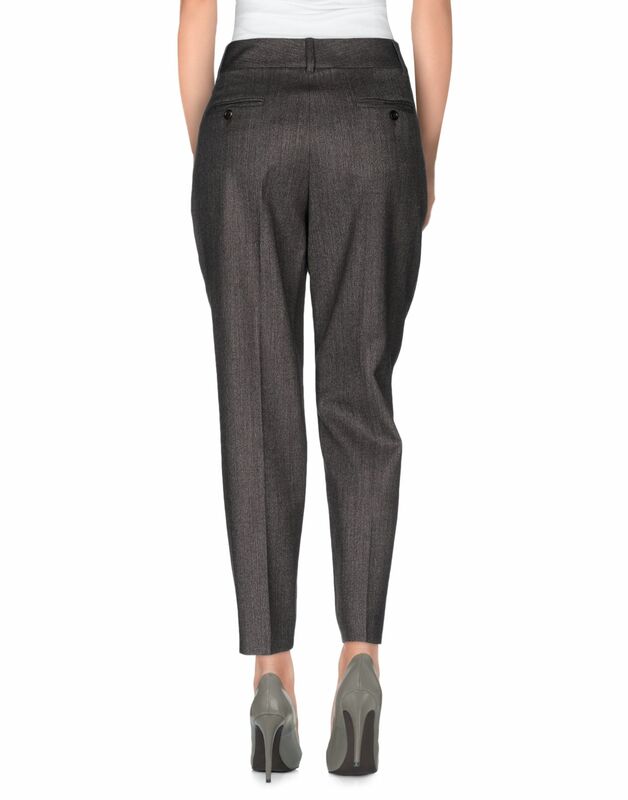 Vous êtes une polyglotte remarquable et votre blog est de haute tenue. Job well done! And I love everything about her clothes, especially the red peacoat. She used her status to push for his release. Amal, please for the love of God , eat ! Well done Amal. You made me cry, great job. Good for her. Well done Amal. Because he is not and was never a “prisoner” is the commonly understood meaning of that word. Because he was/is a political prisoner. Because the UN has determined that his detention was unlawful. There is agreement among a large number of countries on this point. His release was negotiated by the UK, India and Sri Lanka through diplomatic channels at the highest level. This was not a release that would have in any way resembled a standard prisoner release. This would never have been in the equation. 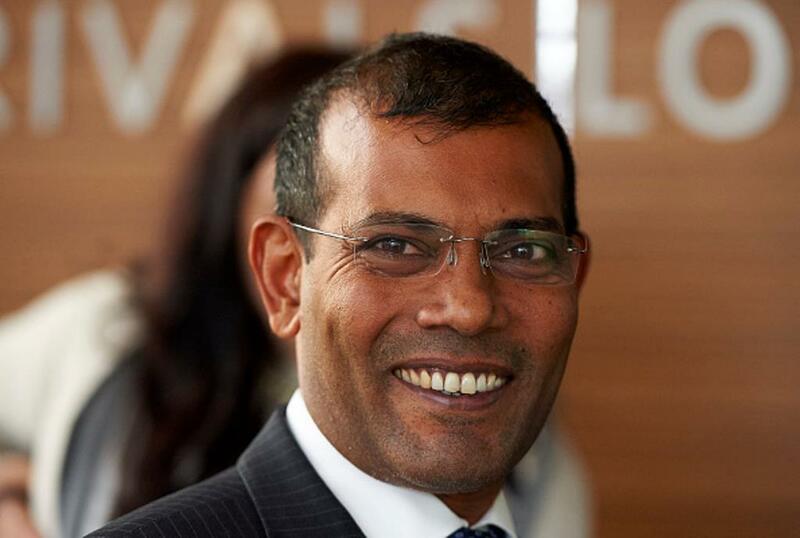 The Maldives were persuaded that the country’s best interests were served by releasing Nasheed. Which frankly is absolutely correct. The missing pieces included sufficient pressure to ensure that the Maldives understood that the problem was not going away and a willingness on the part of a number of government with longstanding and close ties to the Maldives to step up. All of this was made possible by the work of his legal team in moving this issue to the front pages. I am going to add here that the US has also held political prisoners – although the realities of geopolitics means that the US has not acknowledged this – nor are they ever likely to. The Cuban Five were held on similarly bogus charges for years. They were recently released and returned to their homeland and families. No shackles, no prison garb and largely no fanfare – as such is the political reality in today’s world – and the diplomatic reality in terms of the delicate relationship between Cuba and the US. All of which makes international law, including international human rights law, extremely interesting and endlessly challenging. I agree with Jacyln. He is only released temporarily for surgery. Will he not be returning after his surgery is done and he has recovered? I’m confused as well. And when is this so-called surgery? 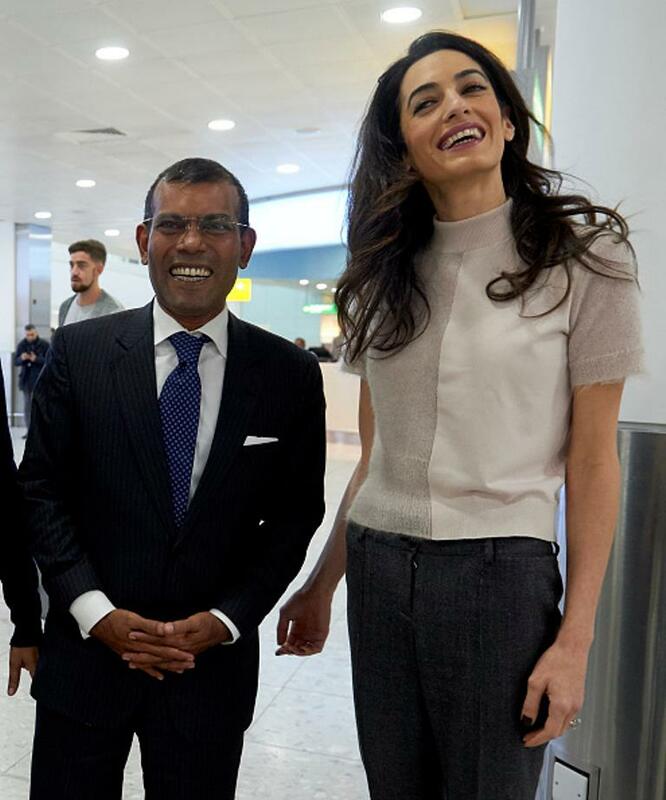 Nasheed said he has, “backaches”. Who doesn’t? He appears to be walking around fine and stands quite erect and walks with ease. Is this just an embellishment to be temporarily released and to seek out the media rounds while the opportunity exists? Not adding up. The camera man who nearly dropped his camera while filming Amal?? (tvjakeny) He’s Jake Whitman NBC NEWS producer, photojournalist and editor. (Meet the Press, The Today Show, Cynthia McFadden & Nightline News, NBC World News with Lester Holt are all NBC affiliate shows). So Amal must have arranged for NBC to continue ongoing coverage. Jake Whitman flew to London Heathrow. He was hired to do so. Smart move and advantageous for Amal to catch the camera. This blouse is DEVINE! Flowy, feminine and still warm and woolly. Just loving it! Compliments her figure too. Could you, Nati, suggest where to find similar styles? 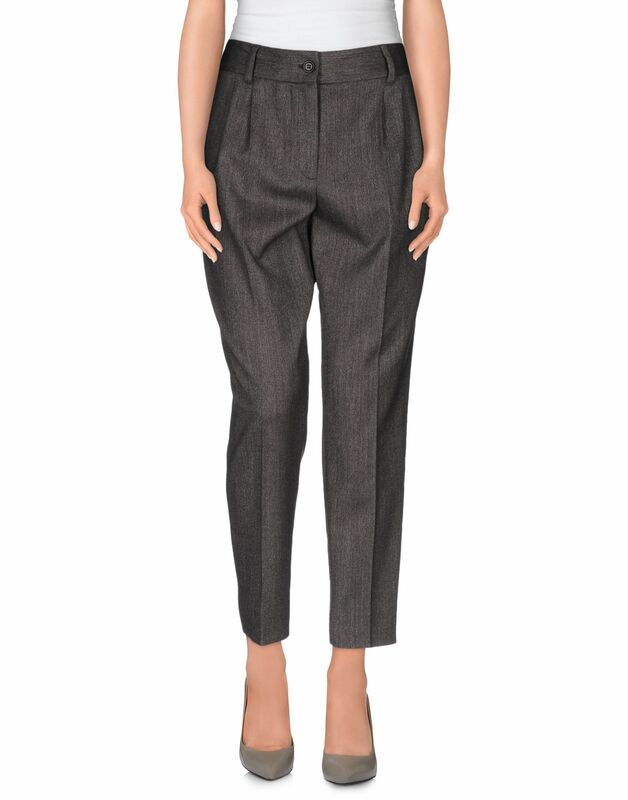 Also love the coat but the cropped trousers seem too chilly for winter use. I also congratulate Amal for doing a great job on behalf of her client. Jacklyn: I doubt Amal had anything to do with orchestrating/arranging an NBC photographer to come to London. It is a story worth following and whatever NBC or other affiliates decided we are not privy to know. We can just sit back and watch this interesting story unfold. I hate to sound negative, but it seems that Amal’s PR campaign is trying to make her out to be an unelected ambassador of sorts. She is a member of a legal *team,* but they hardly ever get any press coverage. Whenever I see a photo of her now, I think of it as advertising for her legal service, and not so much as a testament of her legal prowess. Why the need for so much advertising? 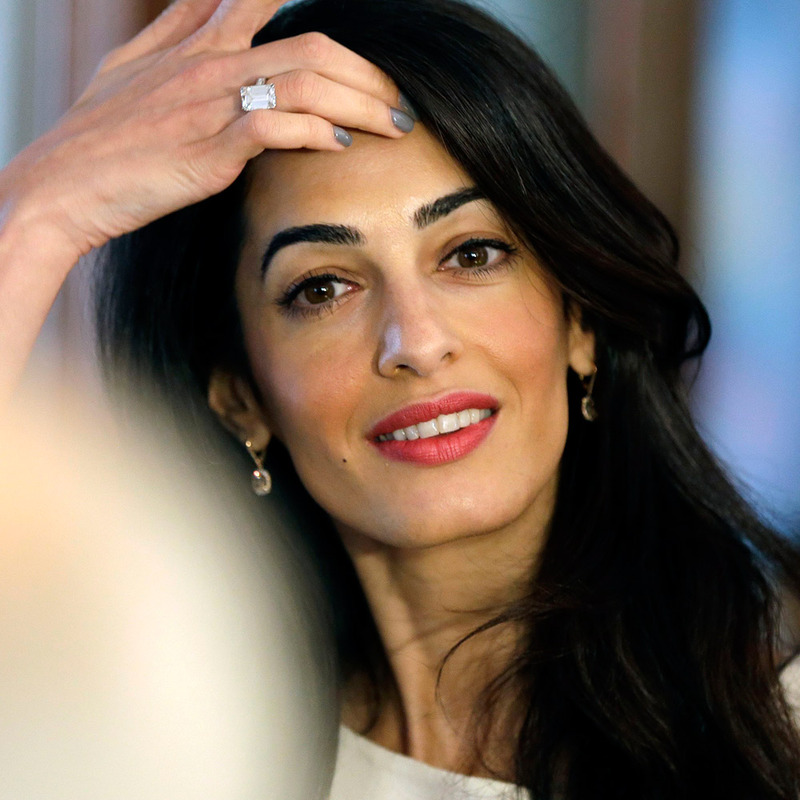 Furthermore, I worry that the things that Amal does with regard to publicity may end up having negative consequences for her clients or other people similarly imprisoned, if not now, but in the future. And, PR and lobbying can work any way that you want them to work – for instance, who’s to say that the governments that she targets won’t start doing the same, if they haven’t already? Then, it boils down to a question of funds – whoever has the most money to burn on PR will have the greatest say in certain media outlets. This already happens a lot in the U.S. There is a reason why courts and certain codes of professional conduct exist. In a capitalist society, impartial “courts” (of public opinion, for instance) can be swayed and dominated by those with the most money. Whoa, great point Lady! Very intelligent perspective. I agree with you. We see it all the time: money=leverage=power. You are so correct. Then it turns to rhetoric. 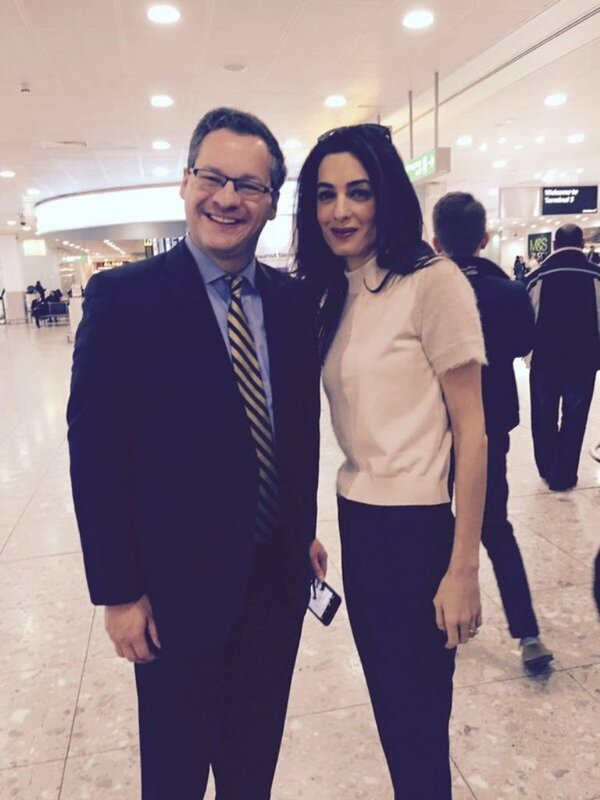 Nati, where are the pics of Amal with David Cameron? And today Amal in red dress? Sorry, I was quite busy. They will be ready in the next days. Do you think we will be able to watch a video of the full press conference online? 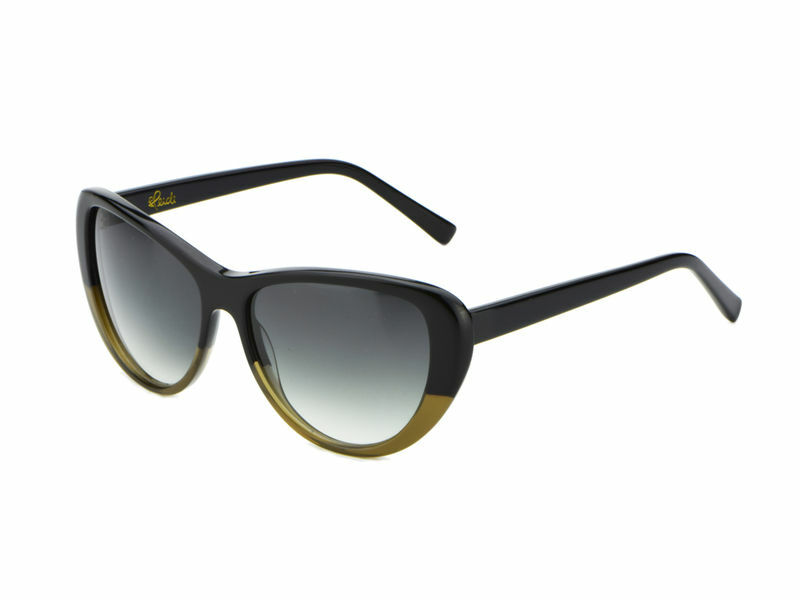 If so, does anyone know where to find this :)? Yes, it was online without the press conference. I made some captures. There is a video of her arrival only. What wonderful work Amal is doing! But I was shocked with the twentieth photo you posted Nat (the collection of photos posted after the clothing recognition ) Amal looks disturbingly thin Amal please take care of yourself too!!!! I agree Jenny. It’s concerning when the bicep area of your arm is nearly the same diameter of your wrist. And when your thigh is nearly the same diameter as your ankles. Dropping weight is causing her to lose her shape. It’s clearly not an athletic/hits the gym/healthy body. It’s rather, eat 300 calories a day and this is all. Not the healthy way to live. As a result, she is looking A LOT older. Any news about the red coat? Its stunning. Looking forward to when you find the ID. The colour is lovely!